Rare earth metal recycling could resolve a geopolitical power headache, and Honda's new process is a big step in that direction. Honda is addressing a geopolitical power concerns in developing electric cars, the availability of rare earth metals. The company on Tuesday updated a process for recycling rare earth metals from nickel-metal-hydride (NiMH) batteries, allowing the material to be used in building new NiMH batteries. The move is a step towards resolving one of the inherently unsustainable factors about cars, by providing a path to reuse of materials in the cars rather than just dumping them into a landfill. Availability of rare earth metals is a big geopolitical concern, because China has effectively cornered the market. While these metals can be mined in many parts of the world, China has secured dominance in the market causing others to be worried over supplies. These metals are used in a wide variety of electronics gizmos. In electrified cars, rare earth metals are often used in motors, for high powered magnets, and in batteries. 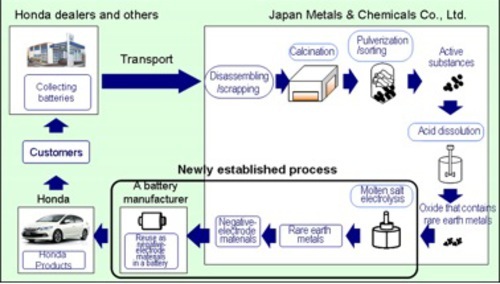 The rare earth metals recycling process Honda developed, in collaboration with Japan Metals & Chemicals, is the worlds first mass-production recycling process to extract rare earth metals from nickel-metal hydride batteries for new nickel-metal hydride batteries. What Honda announced this week is an update to a process for rare earth metals recycling from used nickel-metal hybrid car batteries announced in April 2012. So far, Honda has been extracting an oxide containing rare earth metals from used nickel-metal hydride batteries at the plant of Japan Metals. What's changed is to apply molten salt electrolysis to this oxide. With the new process the material extracted from NiMH batteries can be used directly as negative-electrode materials for nickel-metal hydride batteries, has a purity of more than 99% (as high as normally traded material), and enables the extraction of as much as above 80% of rare earth metals contained in nickel-metal hydride battery. A test run has been made, extracting rare earth metals from nickel-metal hydride batteries collected from 386 Honda hybrid vehicles that were damaged in the Great East Japan Earthquake. That material is being sent to a battery manufacturer, who will reuse them as negative-electrode materials for nickel-metal hydride batteries for hybrid vehicles. As soon as Honda can build up the production volume, the company will begin using it to recycle rare earth metals from used battery packs collected by Honda dealers. The goal is to extract rare earth metals not just from batteries but all other components in Honda's vehicle line. Honda is pledging to remain committed to reducing the environmental footprint of cars and driving, not only by developing fuel efficient vehicles, but by looking for ways to strengthen recycling and reuse of materials used in car manufacturing. Is nickel a rare earth element? Look it up! My comment was directed at this article and the association of Nickel as a rare earth element not in other situations.